COLUMNS When racism disrupts the 'normal' and 'peaceful' America! COLUMNS Turkey's failed coup and post-colonial custodianship! COLUMNS 1492 Expulsion, Inquisition, Balfour Declaration and the European question! Muslims across the globe have been under a sustained assault on everything related to their identity, politics, religious discourses, gender relations, economic views, as well as their dietary requirements, to name a few. Engaging the Muslim subject in civil society is highly problematized to an extent that an abnormal pattern becomes the norm through which Muslims, as individuals and groups, are framed and approached. Essentially, in political and public discourses, the Muslim subject is essentialized, demonized, racialized and sub-humanized to the extreme. Muslims, as a distinct category or actually a field of study, are used as an identifier of a posited sub-humanness in contemporary discourses and global civil society. Nothing is "normal" about the Muslim subject and everything revolves around an abnormal category. Naturally and as expected, the impacted and demonized Muslim subject begins to explore ways to confront, negotiate and address the rising tide of the de-humanization faced, hoping that a different reality can emerge, though the range of possible actions is epistemologically regulated by the same set of forces that shaped the demonization agenda in the first place. The assumption of the existence of a neutral and un-impacted society's space is a constitutive blunder that ends-up reproducing Muslim racialization and demonization, even though its starting point might be an effort to resist it. Consequently, the response to Muslim sub-humanness takes the form of public acts, language and performing Muslimness discourses that seek to humanize the subject. The starting point of humanizing discourses begins with a set of performative acts to demonstrate and show an audience that Muslims are "like you" – they are not fanatics, they eat fast food, laugh, dance, shop, play sports, worry about make-up, have family troubles, negotiate gender issues and seek to break away from tradition itself. The performative acts take many different forms and contribute in different modes of expressions, but they are all rooted at the core in the humanizing project. If a human is already human, then why is there the need to humanize him/her? This is the most important issue to be raised, and it is missed by everyone involved. George Lakoff's book, "Don't Think of an Elephant," is an important read to be able to navigate the terrain of the dehumanizing discourse that gets to be reproduced through the humanizing paradigm. Lakoff's work focused on the communication success the conservatives had in framing the issues and offered progressives a guide to reframe the debate in the political arena. In essence, the Islamophobia industry has been able to frame the issue and guide everyone to think of the Muslim elephant, a violent, backward, irrational, oppressive to women and despotic specimen that cannot be part of the civilized world. A typical Muslim performance of Muslimness in response to the Islamophobic elephant begins with something like stating Islam means peace, it abhors violence and has granted women their rights some 1,400 years ago, and that terrorists don't represent Islam or something similar. Notice how the discourse is regulated by the Islamophobic elephant and it ends-up affirming the dehumanizing thesis since the focus is on the set of issues that posited by the bigoted crowed and not the Muslim him/herself. Fifty percent of knowledge is contained in the question, but if the questions raised originate in a dehumanization discourse, then the answer ends-up giving meaning and life to it. The way out of this dehumanizing discourse is to engage in reframing the discussion on the basis of a Muslim epistemic that has Muslims speak on their own terms. Answering the Islamophobic dehumanizing questions should not be the Muslims' preoccupation. What is needed is framing the crisis in moral and ethical terms, and not as a solely Muslim problem. Rather than speaking of violence, Muslims should join the ranks of people who speak about the destructive nature of militarism on moral and ethical grounds. Furthermore, a Muslim ethical and moral voice in economics and finance is imperative, but it can't be on the basis of joining the current highly distorted capitalist global market forces. 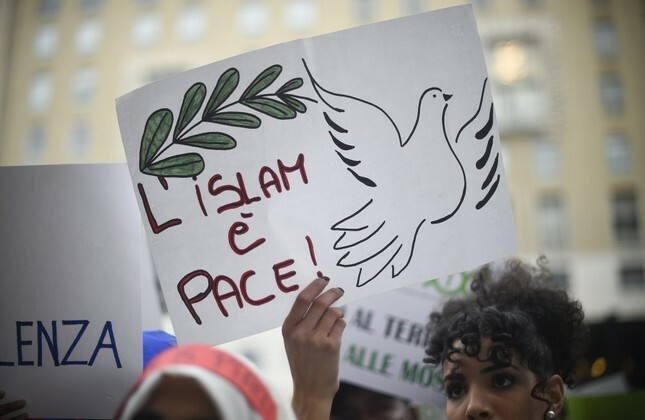 More importantly, Muslims should not shy away from asserting a different epistemic and offering a set of new ideas and proposals to address the various problems confronting the world. Respect is attained when difference is welcomed, and Muslims must insist on being different on a multitude of issues. Saying "I am human like you" will not add to the conversation, and implies a deep sense of dehumanization. Muslims have become conditioned to think through their dehumanization as the starting and end point of their engagement in civil society, which has led to a deeper state of stagnation in exploring ways to come out of it. The road forward starts at centering the moral and ethical Muslim epistemic in all engagements and civil society participants either accept or challenge the veracity of the ideas that are put in circulation. The Islamophobic elephant should not continue to have a free reign in the minds and actions of Muslims and all their allies; the sooner we retire this "circus" animal, the better. Steve Biko's statement, "The most potent weapon in the hands of the oppressor is the mind of the oppressed," is an important reminder of this. Humanizing the human discourse is a dehumanizing act, since it confirms the Islamophobic paradigm and pins it deeper in the mind. The first step in challenging the Islamophobic elephant is in the mind!